Paint Your Faith Toronto is a community initiative to bring together street artists from around the world to spiritually and visually demonstrate their interpretation of faith as one unified unique piece of expression. More importantly, the mural in turn becomes a new gathering place for the community to create dialogue about life, spirituality and art while beautifying the surrounding milieu. One has to look no further than the wall located at the corner of Church and Shuter in downtown Toronto to see a pulsating example of Paint Your Faith’s mission. Paint Your Faith, much like spirituality, has no real boundaries. You can check out the photostream for Paint Your Faith Toronto here. 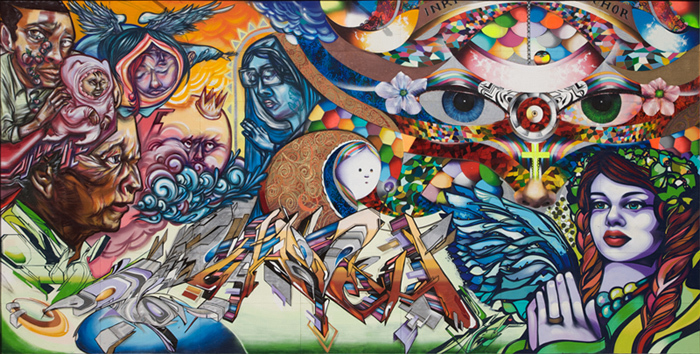 The complete Paint Your Faith mural in Toronto with works by Faith47, Indigo, Titi Freak and Peeta after the jump!